Product prices and availability are accurate as of 2019-01-13 10:07:52 EST and are subject to change. Any price and availability information displayed on http://www.amazon.com/ at the time of purchase will apply to the purchase of this product. 707110 Slide: With Sliding Dual Bevel Features: -Dual rubber grip carrying handles allow for convenient portability.-Lightweight die cast aluminum design for easy transport.-Versatile base can mount to a stand or work bench.-Die cast aluminum table for long lasting durability.-Hold down clamp tightens securely to the work piece to ensure an accurate cut.-Oversized, ergonomic knobs provide ease of use and maximum control.-Innovative Green xacta LaserTM provides high visibility for precision cutting.-Up front controls for safety and ease of use.-Ergonomic, D-shaped, over molded handle for maximum control during cutting applications.-Quick cam miter lock conveniently adjusts and stops at 9 detents: 0 , 15 , 22.5 , 31.6 , and 45 left and right.-Motor current: 15 A.-Blade speed: 4800 RPM.-Blade diameter: 10''''.-Slide: No. Specifications: -Heavy duty 15 Amp motor for various cutting applications. 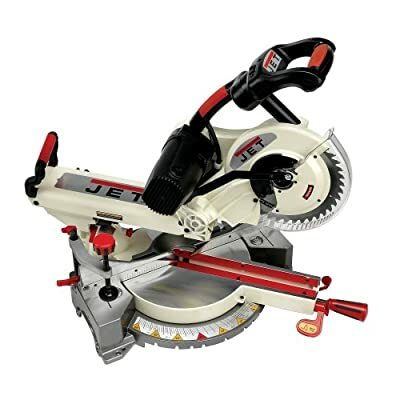 Dimensions: -Dimensions: 17.3'''' H x 20.1'''' W x 23.2'''' D.
Designed and built to provide the power, accuracy, and capabilities woodworkers demand, the Jet JMS-10SCMS 10-Inch Dual-Bevel Slide Compound Miter Saw helps you increase productivity without sacrificing your budget. Complete with a versatile base that can mount to a stand or work bench, multiple rubber grip carrying handles for easy portability, and dual bevel capacities of 0, 33.9, and 45 degrees left and right, this handy tool will be a valuable addition to your shop. Dual-bevel capabilities offer job flexibility. An easy-slide fence makes adjustments quick and precise. The JMS-10SCMS is a versatile, durable, and portable saw. View larger. The green laser is easier to see in bright light. Easy-access controls help you maintain safety. The JMS-10SCMS operates with a robust 15 Amp, 4800 RPM motor that sends its power through a poly-v belt to generate a consistent speed. This belt also substantially reduces vibration and sound for a super smooth cutting action. 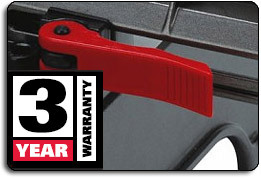 And for peace of mind, a push-button arbor lock makes blade changes easier and safer. The 10-inch diameter blade and innovative design of the operating arm give the JMS-10SCMS tremendous cutting capacities throughout the dual bevel range. With the blade at zero degrees in both miter and bevel, the saw cuts material up to 3-5/8 inches thick and 12 inches wide. 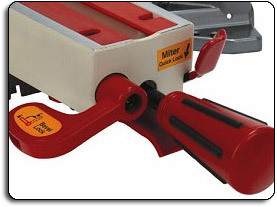 At a 45-degree miter, it handles material measuring 3-5/8 inches thick by eight inches wide. At a 45-degree left bevel, cutting capacity is 1-5/8 inches thick by 12 inches wide, or at a 45-degree right bevel, the capacity is 1-3/8 inches thick by 12 inches wide. The JMS-10SCMS comes equipped with the patented green XACTA Laser--a Jet exclusive. This special laser emits a distinct green light that is much easier to see in bright, outdoor conditions than are the more common red colored versions. 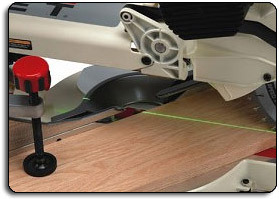 The laser is also mounted in special housing just behind the blade where it remains out of the operator's direct line of vision, but projects its finely focused alignment light across the wood in clear view. Able to handle a wide variety of projects, the JMS-10SCMS features a precision-machined aluminum table surface that is 21 inches wide with a maximum front-to-back support area of 13 inches at the blade. Incorporated into the table are mounting bosses for securing the saw to a work surface or onto a specialty stand. A pullout arm at the rear of the base helps stabilize the machine on a flat surface, and the circular center table surrounding the blade is precisely machined to be flat and flush with the table sections to either side. Additionally, the table extension surrounding the blade path has repositionable inserts that can be adjusted to work much like a zero clearance insert, meaning this saw gives you extraordinary flexibility, even on larger jobs. The fence system is specially designed to be fully functional with the blade at all miter and bevel angles. For added convenience, it's mounted to the base so that it can be adjusted to be perfectly square to the blade if need be, and it extends further to support the work piece on both sides. The fence also has a set of graduations engraved on its face that make setting up repetitive or specific-length cuts quick and accurate. The JMS-10SCMS boasts an ergonomic, D-shaped, over-molded handle for a steady, secure, and comfortable grip. This design also gives you maximum control during cutting operations. In addition, the controls are located right up front, so you don't have to hunt around for them as you work or reach over or behind the blade in an unsafe manner to access them. Instead, everything you need for easy operation is both within reach and directly in your line of sight. 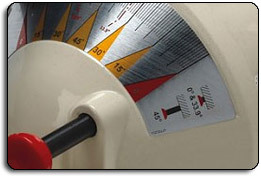 The JMS-10SCMS measures 25.2 x 20.7 x 35.8 inches (WxHxD) and weighs 50.7 pounds. It is backed by a three-year warranty. Jet JMS-10SCMS 10-Inch Dual-Bevel Slide Compound Miter Saw with 10-inch diameter, 60-tooth carbide tipped blade and base.